Mother’s Day is a very special day for a lot of people, but unfortunately not everyone can be with his or her mom on that day. A lot of folks live far away and there are endless obstacles that can keep them from making a visit even when they would want to. This, however, is not reason enough to not commemorate Mother’s Day and show your mom that you appreciate all she’s done for you. You can still send her a gift and – for an added personal effect – you can send her a card you made yourself! 5 by 3 ½-inch card-weight paper. Decorate the card in a meaningful way that will show your mother how you feel about her. If you’re an artistic person, you can use your water colors or a nice sketch. Otherwise, you can print out a picture that epitomizes your relationship with your mom and paste it on the front of the card. 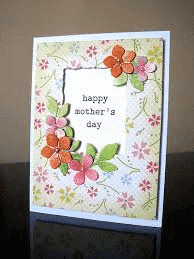 Using your thread and embroidery needle, sew an arrangement of beautiful flowers on to your mom’s Mother’s Day card. This may be tricky for a beginner, but it is certainly excellent embroidery practice and your mom is worth the extra effort. Write a couple deep paragraphs about how wonderful your mom is and sign the card. Put it in an envelope, stamp it with a standard ink pad and send it on its way. A personal touch that I like to add is to put a few hard candy, foil wrapped, in the envelope along with the card. With a card so nice and meaningful, your mom is sure to love it so much you won’t even need to send her a gift. But, of course, you should – she is your mom, after all.